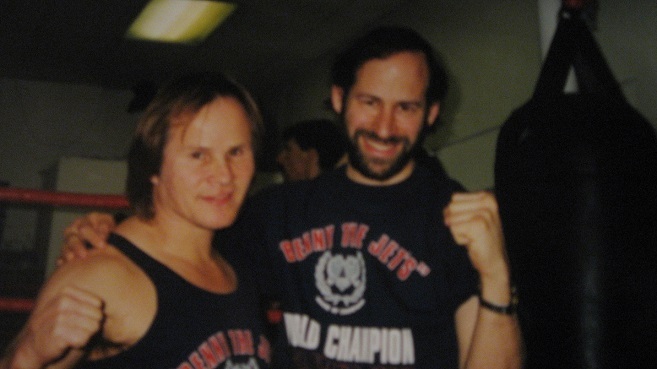 To anyone training in martial arts in the 1980’s Benny “The Jet” Urquidez needs no introduction. Even today, any serious martial arts practitioner should be well acquainted with this legendary fighter, trainer and fight choreographer. I of course learned about him by the countless articles concerning him in martial arts magazines. To meet such a person, well, I never really imagined such a privilege. I wanted to meet The Jet, and to have the privilege to train with him. I flew to Los Angeles, California and I just knew I had to go to the Jet Center. I spent hours trying to find it. Turns out the old location was destroyed by an earthquake or something and they relocated to right near where I was staying. He was right under my nose. I had just met Sensei Sara and would soon meet more of the “first family of kickboxing”. What a thrill to be at the Jet Center. Friday morning Sensei Sara taught a great kickboxing and fitness class. She has such positive energy, which the students pick up on. Although there were many similarities to what I had learned, there was also a great many new drills. She also showed me some great stretching exercises that Sensei Benny, as he is known to his students, developed. Meeting Sensei Benny was a true thrill. He is modest and friendly, does not act like an undefeated world champion. We spoke about the work he does with gangs in LA. One of his nephews was killed by a stray bullet in a gang fight years ago. Since then he has devoted himself to combating gang violence. We spoke about his fight choreography on films in LA. We also spoke about some of the interesting people he has trained such as Bruce Lee’s daughter Shannon. The Jet is descended from American Indians, (Mohicans, if I am not mistaken) and clearly has their fighting spirit. He also has compassion, kindness and generosity. I had the privilege of fighting in the ring with some of their fighters. Although I did not have all the protective gear they still allowed me to fight, “He’s from Israel”, they said, “Those guys are tough”. I came back to train many times. On one occasion I was quite honored and surprised to see a photo of me on display. We still have photos of “The Jet” and his family on our dojo walls. To me Sensei Benny epitomized the true warrior, honesty, humility, patience and kindness. I say this not from reading about him but from what I felt when I met him, when I had the honor of meeting him. Just a regular guy you can talk with, eye to eye, a regular guy who just happens to be one of the most awesome fighters and teachers of our generation.